Welcome to Nikiana Lefkada apartments complex Christianna studios. In a green setting with beautiful views and just 250m from the sea, you can enjoy with your family or friends holiday. Pervallon pleasant, hospitable people and all the amenities you need from an accommodation at affordable prices. 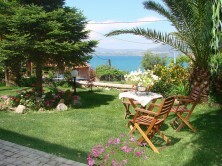 In the green Nikiana (8klm the town of Lefkada and 4klm Nydri) is the complex of apartments for rent.